Oliver Ellsworth's homestead was built by Samuel Denslow to specifications laid out in a contract between Ellsworth and Denslow dated 26 February 1781 on land that had been in the Ellsworth family since 1664. This contract was specific as to dimensions, rooms, materials, cost and quality. 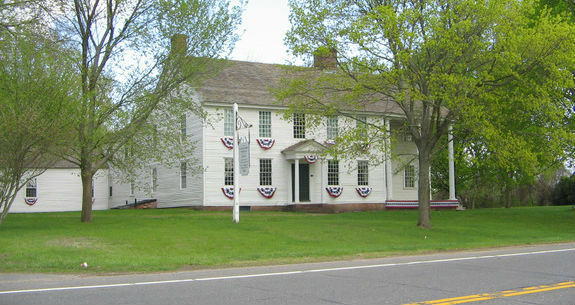 Built in 1781, the original house is a two story wood frame building on a stone foundation. It had a peaked cedar shake roof and clapboard exterior walls. Its design was four rooms on the first and second floors with a central hallway running front to back. Twelve over 12 sash windows were specified by Ellsworth, as were the two chimneys. In the early 1790s, Ellsworth commissioned Windsor architect and builder, Thomas Hayden, to make changes to the original structure, most notably a two story addition on the south side for the drawing room on the first floor and a bedroom above. Daughter Abigail was married in the drawing room in 1794. Elmwood has the distinction of being visited by two sitting Presidents. On 21 October 1789, President George Washington visited, entertaining the Ellsworth children by singing the Darby Ram. On 3 October 1799, President John Adams was a guest of the Ellsworths. By 1836, the colonnade or porch with overhanging roof was built for Martin Ellsworth. Continuously occupied by Ellsworth family until 1903, Elmwood was deeded to the Connecticut Daughters of the American Revolution by the 116 living heirs of Oliver and Abigail Ellsworth. It has been open as a museum since that time. Listed on the National Register of Historic Places, the Ellsworth Homestead underwent massive restoration during the late 1980's and early 1990's. The DAR restored it to what is historically correct for Oliver Ellsworth's life there (1783 - 1807).